This is a taste treat our family enjoys for our holiday brunches. We were all thankful when daughter Deb introduced us to these wonderful little bites of YUM! These are sure to fly off the plate as it's hard to stop at one! Give them a try - your family will think you're the greatest! Preheat oven to 400. Grease 10 cups in a muffin tin. Drain pineapple; reserve juice. Combine pineapple, brown sugar and butter;mix well. 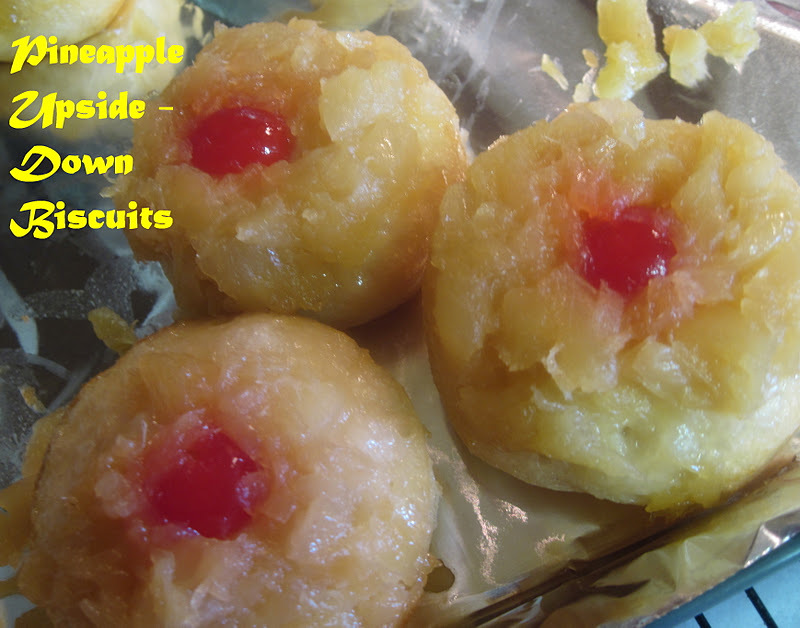 Divide pineapple mixture evenly among muffin cups. Place a cherry in the center of each muffin cup, making sure the top of the cherry touches the bottom of the tin. Place 1 biscuit in each cup on top of pineapple mixture. Spoon 1 tsp. reserved pineapple juice over top of each biscuit. Bake 12 - 15 minutes or until golden brown. Cool 2 minutes; invert pan onto platter to release biscuits. Serve warm. What a delicious, easy dessert - my favorite kind! They look incredible. YUMMM-O!! That is funny how we both posted a pineapple dish on the same day....Great minds think alike. These look and sound amazing. And hooray for super easy:-) These are being pinned for sure!!! Beautiful flavorful biscuits - pineapples are a much-loved fruit at my home and so I'm always on the lookout for pineapple recipes:)This sure does score on the top! !Have a lovely weekend dear!